In Boyle Heights, gateway to East Los Angeles, sits the 1889 landmark “Hotel Mariachi,” where musicians have lived and gathered on the adjacent plaza for more than half a century. This book is a photographic and ethnographic study of the mariachis, Mariachi Plaza de Los Angeles, and the neighborhood. The newly restored brick hotel embodies a triumphant struggle of preservation against all odds, and its origins open a portal into the Mexican pueblo’s centuries-old multiethnic past. Miguel Gandert’s compelling black-and-white images document the hotel and the vibrant mariachi community of the “Garibaldi Plaza of Los Angeles.” The history of Hotel Mariachi is personal to Catherine López Kurland, a descendant of the entrepreneur who built it, and whose family’s Californio roots will fascinate anyone interested in early Los Angeles or Mexican American history. Enrique Lamadrid explores mariachi music, poetry, and fiestas, and the part Los Angeles played in their development, delving into the origins of the music and offering a deep account of mariachi poetics. 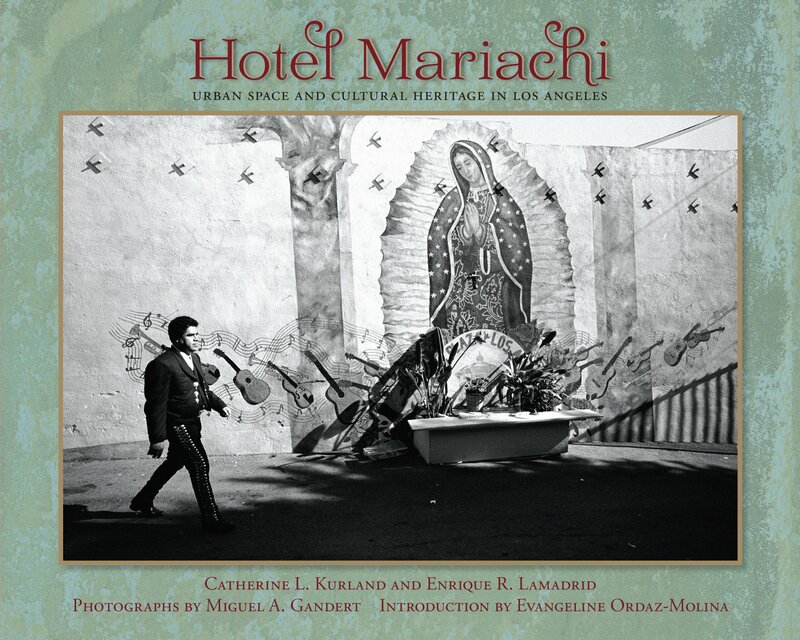 Hotel Mariachi is a unique lens through which to view the history and culture of Mexicano California, and provides touching insights into the challenging lives of mariachi musicians. Miguel Gandert, internationally known documentary and art photographer, is distinguished professor and director of Interdisciplinary Film and Digital Media at the University of New Mexico. Enrique R. Lamadrid is distinguished professor and chair of the Department of Spanish and Portuguese at the University of New Mexico. He is the author and translator of numerous books for both adults and children. Catherine L. Kurland is award-winning executive editor of Chronicles of the Trail, journal of El Camino Real de Tierra Adentro Trail Association. She lives in Santa Fe. “An awesome ethnography of the mariachis of Boyle Heights, with stunning photos giving readers a sense of place.”—¡Ask a Mexican!